October 15th 2014 – Redwings! 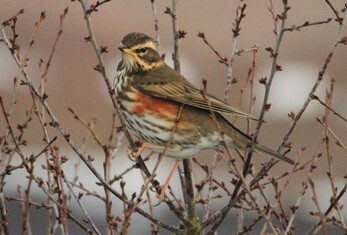 Today the Redwings came. I had been waiting for them and occasionally straining my ear to hear their quiet but clear tseep of a call. Every time I went out after dusk to shut the chickens and ducks in I paused to listen, head tilted towards the dark skies like our resident Blackbirds listening for worms, but with the other ear. As yet I hadn’t heard any calls and it seemed that these winter visitors were not yet passing overhead. The weather over the last week had become ‘Redwing’ weather: grey, cool, damp and a bit misty. Of course, Redwings, our smallest thrushes, are here throughout all sorts of winter weather but somehow deep in my naturalist’s psyche lies embedded an association such that when the weather turns autumnal, I expect Redwings. I had noted with a little disappointment that a single Redwing had been reported the day before elsewhere in the county as secretly I had hoped to get the first report in. Of course this is pure sentimentality as really it would only be my first Redwing, not the first Redwing. But today, I walked out into the garden and immediately could hear the great skyway of Redwing migration passing high above my head. As if standing on the slip-road to a busy motorway service station I then witnessed some fifty Redwings peel off the main flow and drop down and, with a brief flutter of agitated wings, land in the tall plane and horse chestnut trees around the garden. With their tseeping calls it was as if they were, all in one breath, wishing their fellow travellers God-speed while letting out a sigh of tired relief at the Welcome Break. The spectacle only lasted a moment as the Redwings, leaving their engines running, rose up in smaller groups as if struggling to adjust to the sudden braking of their flight, and moved beyond our trees and out of sight. Brief though it was I nevertheless felt that unmistakable thrill of reconnecting with a familiar winter bird and being witness to its moment of relief at ending its journey and landing in our Redwing-friendly garden. Now I know that most nights when I venture into the garden I will hear that urgent tseep call and know that far above my head, somewhere in the dark, a little Redwing is passing. The season of thrush movement has begun and not far behind will be the larger Fieldfares with their chack-chack calls and fluttering wingbeats. It feels barely a few weeks ago that I was watching them gather to leave this spring – I do believe time may have flown too! We are probably all familiar with the Grey Squirrel particularly at this time of year with an abundance of nuts and fruit in many gardens. I think we must have about five individuals working their way through the conkers and yew berries each day. I keep uncovering poorly buried nuts all around the garden, some even just tucked in at the foot of a wall but no doubt stored for future use – that is if they are still there! I find the squirrels very characterful and not at all like ‘tree-rats’ that some would call them. I may of course change my mind when the winter bird feeder is once again assaulted by their tiny teeth and claws but for now I’m enjoying watching them in the garden. They are, however, as many will already know, north American invaders, who, due to their greater aggression, drove out the native Red Squirrel of story book fame. The smaller, cuter Red Squirrel with its ear tufts and rusty fur is now banished to far-flung woods on the fringes of our isles. Great efforts are currently being made to re-introduce the Red Squirrel back to former territories and this is good news but will undoubtedly take many years. I wonder if one day, like the Red Kite, I, or my children, may find Red Squirrels in the garden; but will they reside happily with the Greys I wonder? There is another north American invader that I have encountered in St Albans and which is really the unwelcome monster I refer to: the Signal Crayfish. I was at first delighted to discover crayfish living in abundance in the River Ver that runs through St Albans but beneath the surface lay yet another dark tale of the demise of another of our native species: the White-clawed Crayfish. 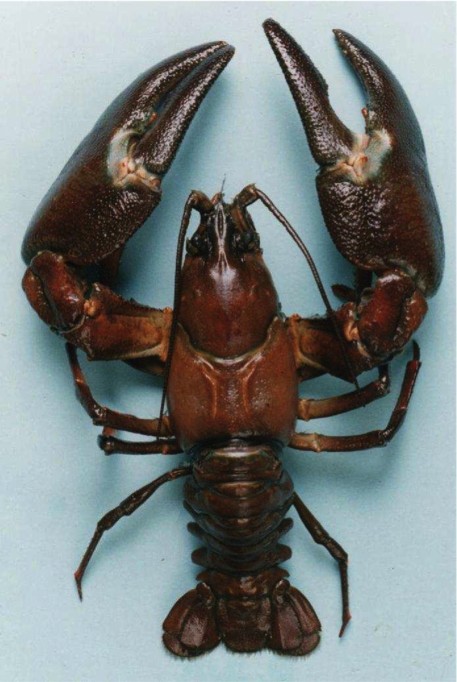 Like its squirrel counterpart, the White-clawed Crayfish is smaller, less aggressive and most importantly unable to combat the ‘Crayfish Plague’ which its north American cousin is not only immune to but also spreads. The result has been the complete disappearance of White-clawed Crayfish from our rivers save a few carefully protected sites around the country. St Albans has been thoroughly taken over by the Signal Crayfish and they now provide children with the opportunity to ‘go crabbing’ in an urban setting. 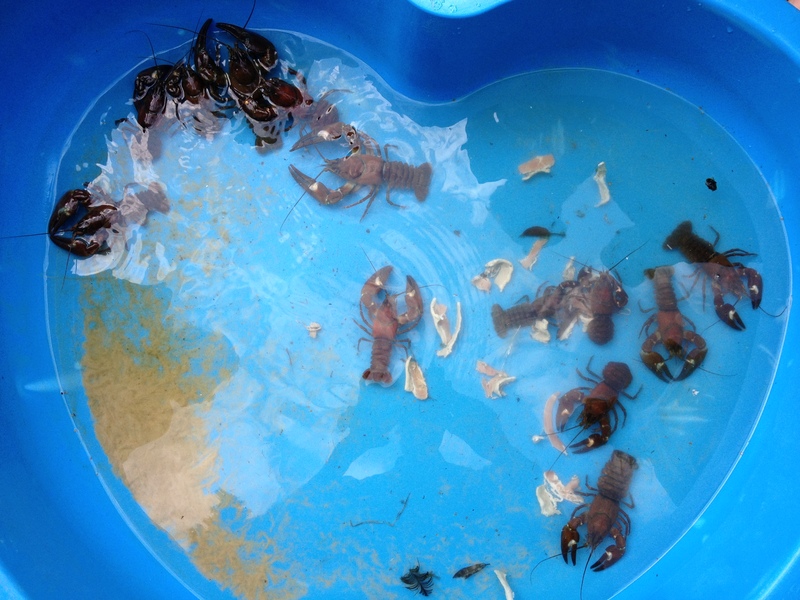 I observed some children catching crayfish a few years ago and was amazed at how many they had got in their bucket. I resolved to have a go myself if only to examine these mini-lobsters up close. Not living by the sea I realised I had none of the tools of crabbing and no shops to buy the ‘crabbing kits’ from that you will often find in seaside towns. Instead I improvised, using a bricklayer’s line and peg for the weight attached to a string bag some lemons came in. I then made a couple of nets with string bags some logs came in, wrapped around circles of wire stuffed into the end of some long bamboo sticks. I was very pleased with my make-shift fishing kit and set out with my son in search of crayfish. To lure the crayfish we took with us some bacon, just as we used for coastal crabbing. I also took a large ice-cream container with a lid just in case we were successful. Feeling a little bit like poachers we settled on a still pool of water near a mill house that looked as if the mud might hide some hungry crayfish. I wasn’t at all sure how ‘crayfishing’ fitted into the bye-laws of the river but had done enough research to know a few key facts. Hooking out the odd Signal Crayfish was certainly not forbidden but if we wanted to set traps and catch them by the hundreds we would need a license. This is simply because trapping involves higher numbers and is far more indiscriminate meaning the risk that other species, even the White-clawed Crayfish, might be caught too. The one law that did intrigue me was that once a Signal Crayfish had been caught it is actually illegal to put it back. I assume on the basis that you would be re-introducing it to the wild! This translated as one thing and one thing only for my son and me: we were going to have to eat them! So I came prepared just in case we were successful. Standing on the bank by the pool we cast our first line complete with weight and a juicy bit of bacon in the bag at the end. Now as you can imagine the suspense was a little too much for a small boy and before long my son jumping around knocked stones and gravel into the pool. Convinced that all crayfish would now have dispersed and that our chances were over I chided him for his unstealthy approach to the matter. I needn’t have feared as almost before the words were out of my mouth he’d caught one! After that it seemed easy. Each line received a bite within seconds of touching the muddy bottom. In fact, more often than not, we could actually see a crayfish moving towards our bait. The tricky bit (as with seaside crabbing) is to then pull the line up with the crayfish clinging to the bacon and pop it in a net before it realizes and lets go. With two of us working together we became quite adept at this and it wasn’t long before we had a reasonable catch of thirteen good-sized crayfish. I reckoned that this was enough to give us a plateful and perhaps contribute a little bit to conservation and the return of the native crayfish. Back home we were able to take a good close-up look at the crayfish. They really are like small lobsters and are very eager to nip you if they can, so we wore gardening gloves. They seemed to have hardly noticed their transfer from the river to a garden paddling pool and continued to sift and munch on bits of bacon as if nothing had changed. 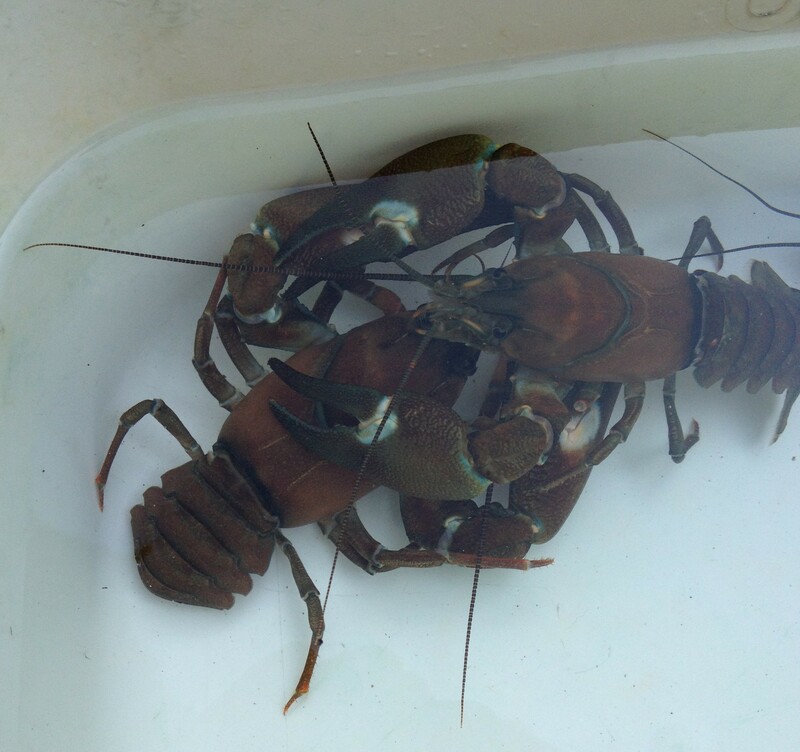 The male Signal crayfish grow to a fair size – our biggest was about 15cm long. They have a number of key distinguishing marks but the most notable are their rusty-red colour and white/sometime turquoise spot on either claw. These bright claw spots tend to give them away on the river bed. So to the business of cooking and carefully following instructions downloaded from Google we boiled up the catch and then set about extracting the tail and claw flesh, a little bit like you would for prawns or crabs. 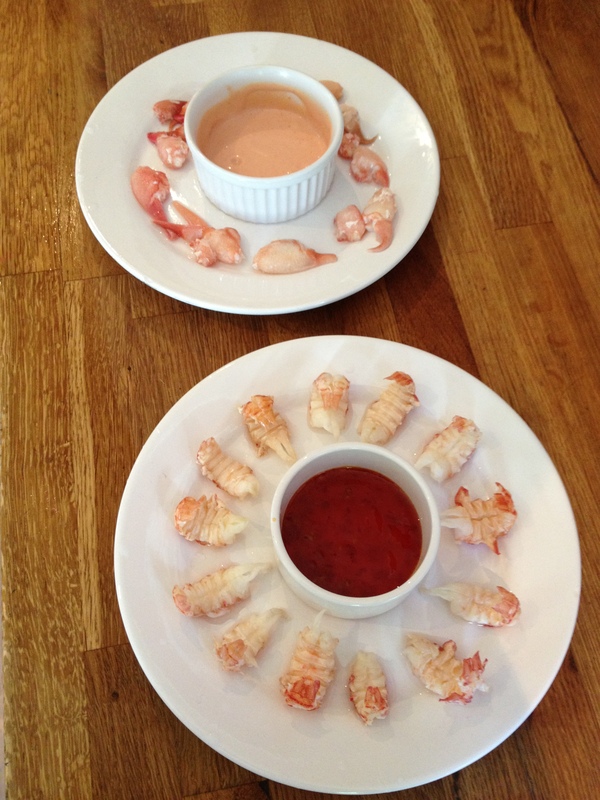 At the end of the process we had a plateful of crayfish ready to eat and I have to say they were delicious dipped in a little mayonnaise and a dash of tomato ketchup. We felt like bone fide foragers and it did get me to thinking how many other sources of food might be found on our doorstep. This September I’ve noticed lots of Signal Crayfish almost every time I’ve walked next to the local River Ver; some of them within easy reach of scooping out. 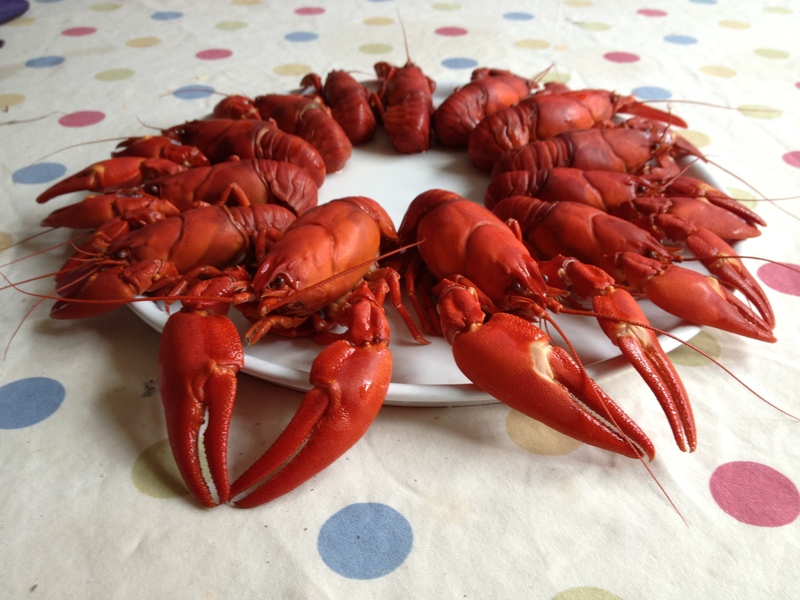 But remember, if you do, you should really do our native White-clawed Crayfish a favour and eat them! Should any of you venture out please take a look at the link below to a very clear downloadable identification sheet for the crayfish. I’d hate to think anyone accidentally pulled a native species out!